I am in total awe of Amy Bartol, every book I read of hers just gets better and better. This series needs to be a film, seriously!! I feel the same about the Premonition series too...Amy has this incredible talent for scene setting, she brings her books to life through words, but so vivid and descriptive are those words that you can picture yourself in these places in the midst of battle and you cannot help but be drawn in to these worlds that she painstakingly creates. Ethar is no different, while reading I felt as if I was there watching the action unfold before my eyes, I could feel it and I could see it. This book continues where Under Different Stars ended. The political discord in Ethar is reaching an all-time high and Kricket is unfortunately at the centre of it. With Alameeda declaring war on all houses the battles that ensue are epic. With Rafe and Alameeda fighting each other Kricket has to use all her powers to keep ahead of the enemy, an enemy that want Kricket and her powers all for themselves knowing that they could tip the balance in their favour. As we found out in Under Different Stars there is a prophecy that one house in Ethar will rise and the other will fall and Rafe and Alameeda are both determined that they will not be the fallen, no matter the cost or the consequences. Trey and Kricket’s relationship gathers momentum in this instalment and while their priorities are firmly set on survival there are a few moments where we are treated to the Trey and Kricket show. The few amounts of down time that they have are not wasted and Trey is one guy that you cannot help but swoon over. He will do anything in his power to protect Kricket and this is not through allegiance to Alameeda but is born from the sheer love that he feels for Kricket and the feeling is reciprocated. Even though Kricket knows her mere presence puts everyone in danger, Kricket cannot help the pull or the love that she has for Trey and this is one instance you will be rooting for love conquering all. It was great to catch up with the others that are totally behind Kricket and Trey’s adventures, especially Jax and Wayra and Amy Bartol introduces a host of new characters that are just as intriguing as everyone else and I am sure have an interesting story of their own to tell. Kyon is still hot on their heels determined to make Kricket his no matter who he has to destroy in the process to get to her. This man is resilient and persistent, however, even though I shouldn’t I can’t help but have that twinge of “like” for him. This is one thing that frustrates me with Amy’s writing in the nicest possible way, she has this knack of making you like the bad guys too and you feel guilty for doing so. Trey is such a fantastic character, you cannot help but fall in love with him, his fierce sense of loyalty and protectiveness can you bring you to your knees, he is just a good guy inside and out. Kricket really develops in this book, she has to mature and adapt quickly and is so far living up to everyone’s expectations. She does have her moments where she makes some rash and silly decisions but you can always see the method to her madness. I love Kricket with a passion and for someone who is feeling love for the first time you cannot help but hope she gets her happy ever after. 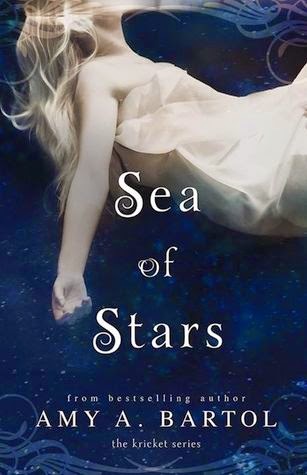 I seriously cannot wait for book 3, Darken the Stars. Even though you have that deep seated sense of foreboding you always have that sense that good will conquer evil and I cannot wait to read this series climax.